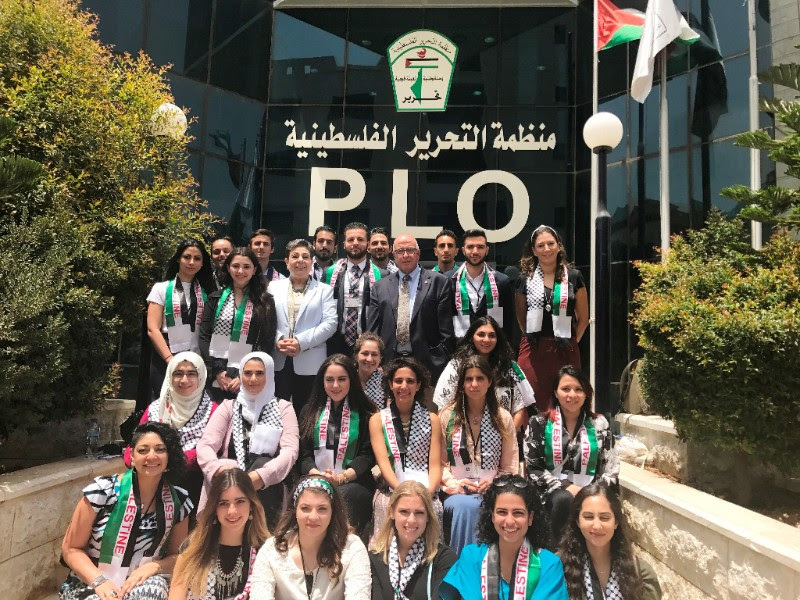 RAMALLAH, PALESTINE (July 12, 2017) — PLO Executive Committee member Dr. Hanan Ashrawi, who serves on the Know Thy Heritage (KTH) Advisory Board, met with the 2017 KTH visiting delegation at the PLO Headquarters in Ramallah and welcomed its participants who represent four continents and seven countries. In addressing the KTH delegates, Dr. Ashrawi stressed that as Palestinians living in exile, Palestinians are united by their national identity and historical roots in Palestine. 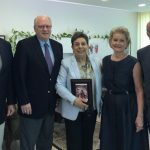 She also reminded them of the importance of reconnecting to Palestine and returning to their homeland to maintain a sense of belonging and to defy Israeli violations and unlawful policies on the ground. Dr. Ashrawi concluded her presentation on the escalation of Israel’s continued breach of international law by taking questions on the internal division, the importance of the BDS movement, American efforts to revitalize the “peace process,” and the role of Palestinians politicians working in the Israeli Knesset. 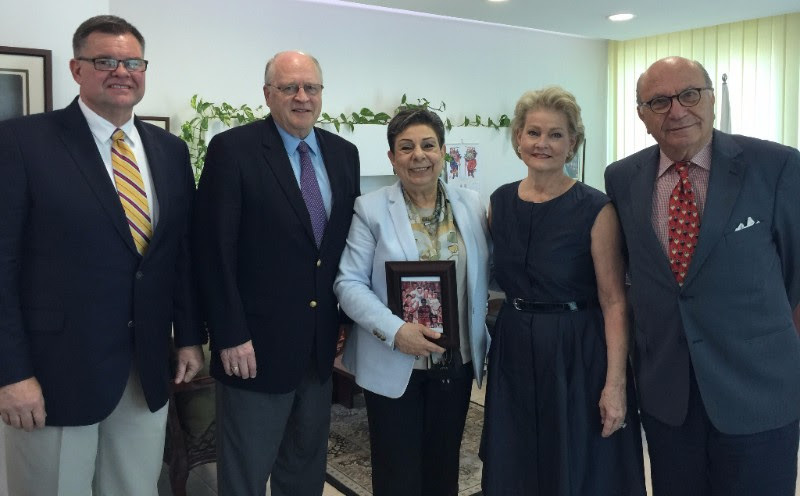 Dr. Ashrawi also met with Rateb Rabie, the co-founder and President of the Holy Land Christian Ecumenical Foundation (HCEF). They briefly discussed the important work of HCEF and issues of mutual concern. Finally, Dr. Ashrawi met with Grace Nelson, wife of U.S. Senator Bill Nelson, a leading evangelist Pastor Bob Roberts, Jr. and Wes Anderson. The visiting delegation was accompanied by Zahi Khouri of the Palestinian Business Committee for Peace and Reform. 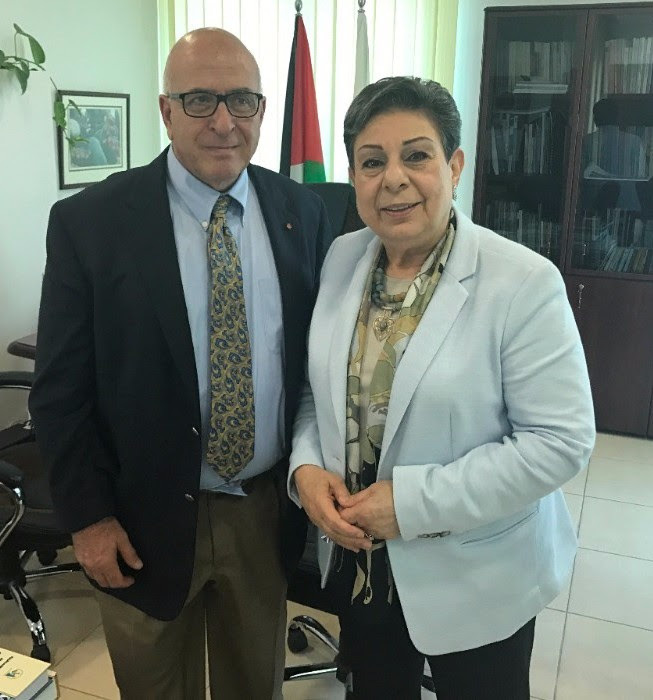 In the context of the American strategic alliance with Israel, Dr. Ashrawi said that the language of both the U.S. Congress and Administration reflects the official Israeli narrative and does not serve American interests or the cause of a just peace. The meeting also focused on American Christian Evangelicals and the important need for them to exhibit the will necessary to play a constructive role in pursuing a just peace and to counter Israel’s systematic impunity and violations of international law. In addition, Dr. Ashrawi and Grace Nelson stressed the important role that women play in ensuring justice and bringing about a human and humane peace. The focal point of the meeting was the comprehensive discussion of the initiative to organize the First National Prayer Breakfast in Bethlehem, Palestine in December and of ways to ensure its success and sustainability.